The Swamp Surfin' Sewer Toad! Napoleon Bonafrog, also known as Genghis Frog's surfin' siblin' from the south, hopped away with his two swamp frog brothers, Attila and Rasputin, to join Genghis in the big city. Together now, they join forces along with the Turtles to lick the evil Foot Clan. Inventor of the "hop, skip and jump" attack formation, Napoleon Bonafrog employs his strategic swamp senses to outwit Shredder's mindless minions. Forever followed by Flyboy, his Mutant Fly Friend, Napoleon drafts his bug buddy into service as a swamp spy. And when Flyboy feeds Napoleon the facts, the fearless frog fights the Foot with his Foot-swatter and Serpent Slasher. 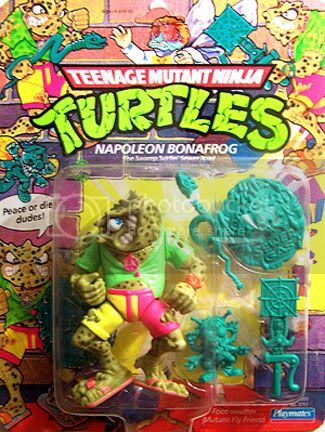 Protected by his horny toad armor, Napoleon Bonafrog puts the Foot down for peace.